PokerStars Live is the name for a series of major poker tours, live rooms and specialised poker events all of which are sponsored by PokerStars that take place around the world. Featuring tournaments, cash games and more, PokerStars Live events take place in some of the most beautiful casinos in the world. When and where are PokerStars Live events taking place? Check out the PokerStars Live homepage for links through to all live poker tours and local card rooms. What is the buy-in for PokerStars Live Main Events? Buy-ins vary depending on which PokerStars Live tour stop you attend, with Main Events ranging from €170 to €10,000 (or its equivalent in local currency). Is there an agreement I need to sign to play at a PokerStars Live event? Yes. A condition of entry into any tournament at a PokerStars Live stop will be the completion and signing of a waiver form. For more details, see our Terms & Conditions. Can I play even if I don't sign the agreement? No; the waiver form is a requirement for participation in any PokerStars Live event. We encourage you to win your entry by playing in one of the many satellites available via our sponsors PokerStars. Satellites come in a range of buy-ins. Just open the PokerStars lobby, click ‘Events’ to see all satellites for every event. If you fail to qualify and would still like to play in PokerStars Live event, you may buy directly into a tournament. See each specific event page for details – including buy-in options. Do I need a Visa to attend a PokerStars Live event? Visa requirements vary depending on which PokerStars Live event you wish to attend. Please check the tournament page for your chosen event for full details. I have won a PokerStars prize package (including seat, hotel and spending money) - can I bring a guest? Yes. If you have qualified for the tournament through our sponsors PokerStars, your prize package includes a double room where your guest may sleep at no extra cost. However, all other costs incurred by your guest, such as meals etc, will not be covered in your prize package. What payment methods can I use for buy-ins? Please see each event page for full details. Will I need special identification to enter casinos in Europe? Yes. You will need to present your passport. What logos am I allowed to wear? PokerStars Live has strict rules on the wearing of branded logos by players at live events. Please click here for the Rules and Regulations page. Will I appear on television? It's possible! Some events are televised, including a featured 'show' table. All contestants are obliged to sign a TV waiver form before play commences. Any player who does not sign the TV waiver will not be allowed to participate in the tournament. If the event is being televised, when can I see it on TV? For information on when you can see the PokerStars Live events on TV or online go to PokerStars.tv. Events will also often be live streamed via webcast at PokerStars.tv. How do I go about opening an account on PokerStars or Full Tilt? Opening an account on PokerStars could not be easier, simply download the free software. 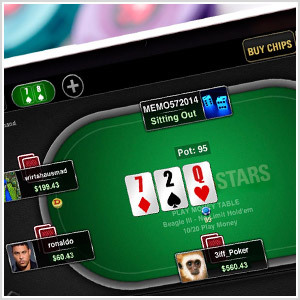 At PokerStars you are able to win your seat to PokerStars Live events via online freerolls and satellites. To play on Full Tilt, visit their website here. If you cannot find the answer to your question here, please e-mail live@pokerstarslive.com.